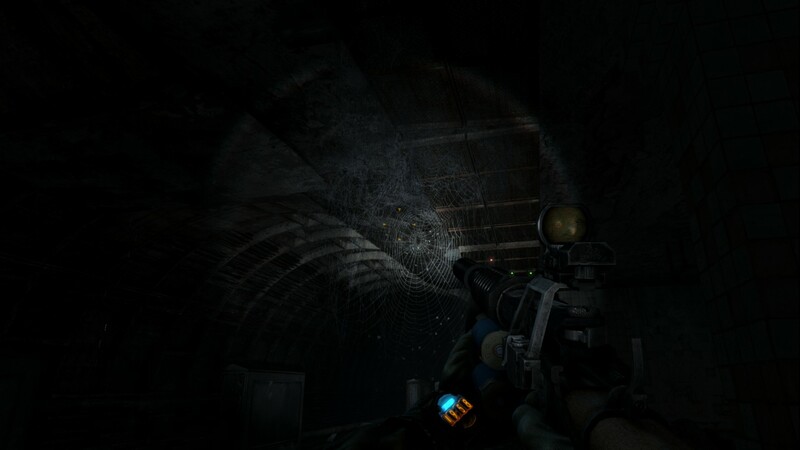 Metro: Last Light is the sequel to the stellar indie game Metro 2033. 2k33 was a very intelligent game, with an excellent premise for an action-horror FPS: The game took place twenty years or so after a nuclear holocaust, where the survivors had managed to seal themselves inside the vast and labyrinthine Moscow Metro system. 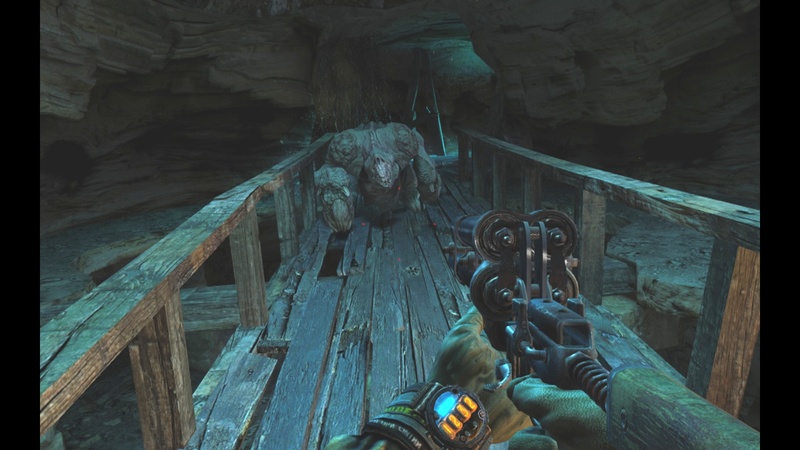 For a while, things were okay – subway stations turned into villages, tunnels into trade routes, and so on – but then hideous mutant creatures started appearing (I guess no post-nuclear game can escape the influence of the Fallout series, which is sorta sad because I always enjoy harder sci-fi in games). 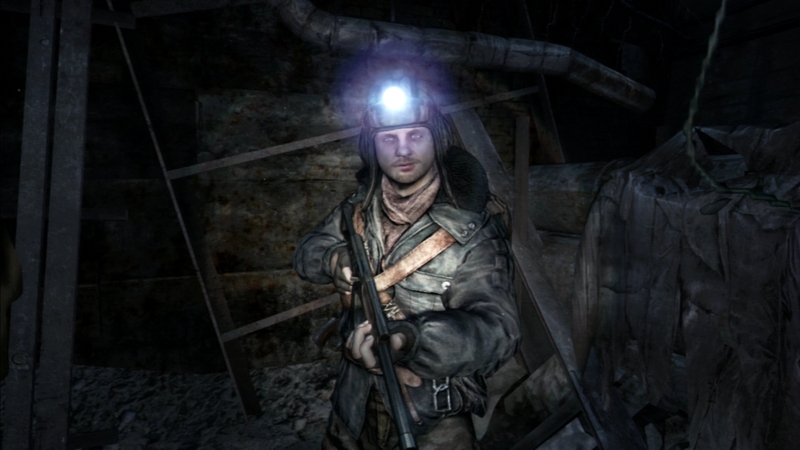 You control Artyom (You’ll be safe with “ar-CHOM”) an unassuming, fresh-faced kid who leaves his station for the first time, and goes on an expedition through both the Metro and the blasted, sterile landscape above as he finds a way to deal with the supernatural mutants once and for all. Since it’s sort of necessary here, I guess I have to give away the ending to the first game- you see, pretty much every time you go through a tunnel, you’re attacked by either the mutants or some kind of mutant radioactive alien ghosts, a bit too far past the point where it becomes expected. As these happen more and more and you continue to survive, it transpires that you are the Chosen One, although who chose you and for what is initially unclear. While I’m still a little shaky on the latter point, the former is revealed when the ghosts confront you at the very end of the game, saying that they were intelligent beings who wanted to make peace…just before you blow them all up. Ah well, classic horror ending. 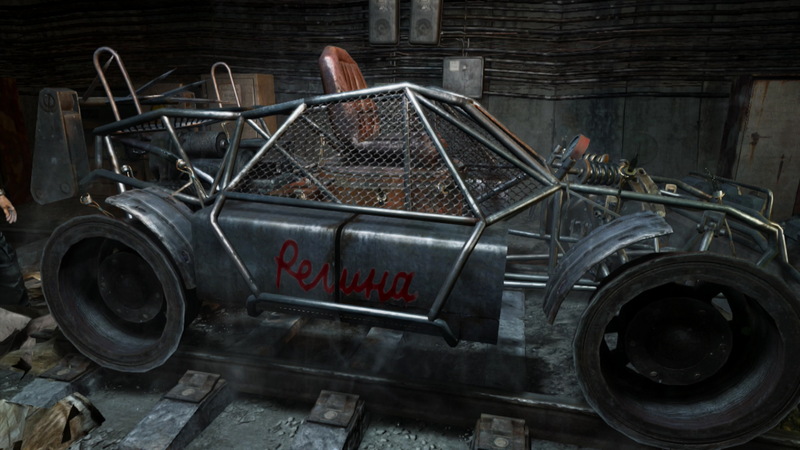 I like Artyom better than Will Smith and his dog, that’s for sure. Speaking of classic horror sequences, the opening of Last Light is a doozy. We open with Artyom as a child, his present-day self narrating his memories of Moscow before the bombs fell, when he visited an idyllic garden with his mom and took the train home…or rather, took the train which would become their home. We get the expected Terminator 2 sequence to illustrate the nuclear holocaust, and as I watched it I started to get a vague sense of unease. See, if there’s one word to describe 2033: A Metro Odyssey, it’s “subtle”. The themes of the work (Yes, it counts as a “work”, like Portal, Deus Ex and BioShock, but completely unlike pretty much anything on annual top-seller lists) are built up gradually and are very naturally woven into Artyom’s travels, and the world he explores is atmospheric, cohesive and meticulously designed, as are the central cast of characters who inhabit it. This is all true for Last Light, and yet…well, I called Portal a genuine work of art, and so the best comparison can be made between that game and its 2011 sequel. Portal 2 had more of everything that made the first game popular, but the expansion resulted in a bloated and emptier feeling, with the greater repetition making everything feel just a bit less special. Last Light has a similar problem: The story and characters have become just a hair too stereotypical and/or cliched for such a unique and human lineage. It still blows the narrative of most other games straight out of the water, but it doesn’t quite measure up to the first game, as its lower-down focus on political intrigue in the Metro succumbs to political-thriller genre conventions. We can see this convention in the opening of the game. While the first game showed you living in an ordinary station/town filled with people going about their everyday lives, this one opens in the headquarters of the Rangers. 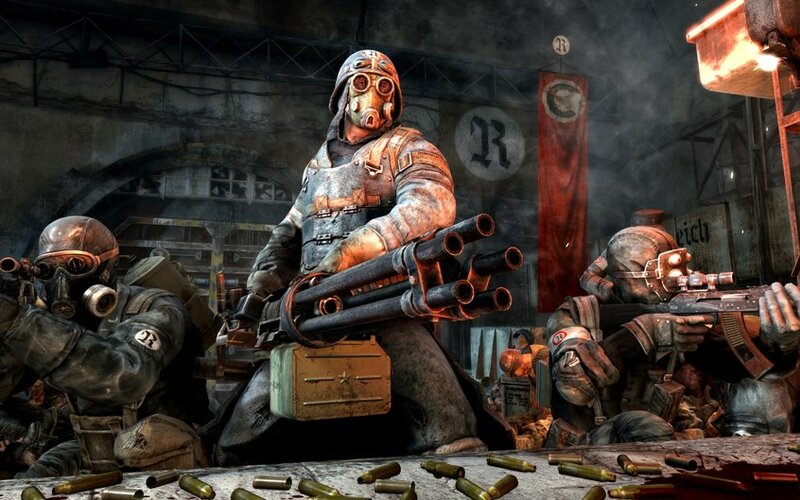 They’re the defenders of the Metro, who have the power and influence to operate above all of the other petty squabbling political groups (No, seriously, these post-apocalyptic horror games have serious examinations of politics in them!) in their efforts to keep the people of the Metro safe. You can see why they stake a claim to all the coolest guns. You’re a Ranger because of what you did in the first game: On your journey, you found a secret stash of enough food, guns, medicine and unreleased Netflix original shows to keep humanity going indefinitely. Even so, people still don’t give you any respect – the game starts when one of your old buddies just barges into your room and wakes you up. He runs away until you complete the movement tutorial, as you hear your fellow rangers trading very normal, everyday conversations that really help to build up both the world and your attachment to the people in it. After your tutorials, your shouty friend reappears. You know how I said I really liked John Metradden NFL 2033 because it was subtle? Well, this guy…he’s one of the least subtle things here. He’s the religious guy who’s required in every post-apocalyptic story – in this case, though, there’s a couple of interesting twists to him. He believes that the bombs weren’t God’s judgement, but in fact also blew up heaven and hell, which explains all the supernatural goings-on. The real strange part is that he’s more correct than most of the Muscovites are in their own explanations – he’s never actually shown to be completely wrong, and he’s entirely correct in his assessment that the alien ghosts are just misunderstood good guys. The news your friend wakes you with is that they’ve found one last alien ghost, in the wasteland above. However, when your boss hears about this, he immediately tells you to murder it and sends you and another ranger up to the surface. As you travel to the surface (on the secret emergency light rail that exists because the developers felt really bad about not getting to have any actual trains in their game called “Metro”), you get to know your player character and her partner. 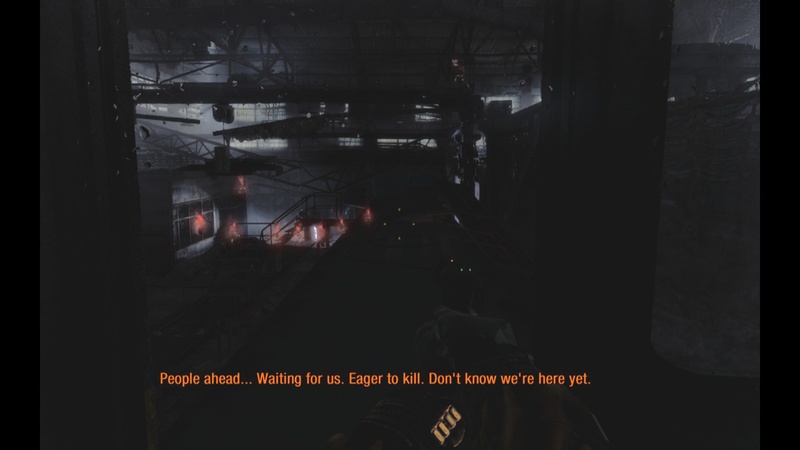 Artyom is a silent protagonist during gameplay, so to characterize him they have to repeat one of the dumber storytelling decisions of Gold Diggers of 2033 – every time you change maps, Artyom pipes in with his monotone Pavel Chekov voice to recap the recent events of the plot and explain what’s going on. And then there’s your partner. She’s the first female character we see in the games, and it’s not a very good start. She’s condescending, confident and stone cold – basically a carbon copy of Anna Navarre of Deus Ex, in every area from her name down to her laughably thick accent…which brings me to another big problem I have with these games as a whole. I’m aware on an intellectual level that all these characters should really be speaking Russian, but I think that giving them accent thicker than a bowl of borscht isn’t the best way to represent this. In fact, it sort of reminds me of the old sixties Mission: Impossible show, where you could tell whenever Martin Landau or Peter Graves were speaking the local Gellerese by their own horrible accents. Anyway, you and Anna get to the surface, where dialogue reveals that even though everything pretty much looks like the same blasted wasteland all year round, it’s apparently spring – gee, I guess that means this game won’t end with some kind of metaphorical rebirth! I kid, I kid – the visual design of the surface is really good at getting you into the mind of someone living in the post-apocalypse, surrounded by all the trappings of a world you never knew. In this case, you walk in the decaying, bleached remains of a forest, until you find the alien ghost. It leads you on a strange, E.T. grown up-style chase until it manages to knock you out and give you some weird telepathic messages, whereupon you’re captured by Nazis. Yes, captured by Nazis. Like, full on, “I hate these guys” Nazis. That’s the privilege of taking yourself seriously – you get to do crazy stuff like this, and if you weave it into the story well enough, no one will think twice. They might go a bit too far with details like the monocled, sadistic death camp Kommandant, but overall it’s a nuanced enough portrayal of socialism for it to be believable: A small, insular and xenophobic group would be very sensible in a world where crazed, irradiated mutants are an everyday fact of life, and wanting genetic purity would spring very naturally from this. You break out of the Nazi camp with the help of a communist. As is to be expected in Moscow, the Communists are one of the largest political parties in the Metro – they’ve even gone to the trouble of taking over the system’s entire Red Line for the sake of iconography. They’re shown to be in a shaky state of peace with the Rangers despite their constant drive toward expansionism, which, I think, means that we can’t escape playing as an American, even when we’re playing a game set entirely in Russia and not featuring anyone who hasn’t lived in Russia all their life. But this pinko here, he’s okay. He helps you out of the prison, the two of you save each others’ lives a few times, and he becomes a friendly and non-annoying presence…meaning of course that he’s bound for either betrayal or death. But for now, he’s a welcome color commentator during the gameplay. I was initially betting on “death” – he’s the brash extrovert to contrast your complete silence, so it seemed natural. As for that gameplay, it’s pretty darn good. It’s a pared-down version of the first game’s gameplay, and it’s well paced as the game goes on and more of the world opens up. 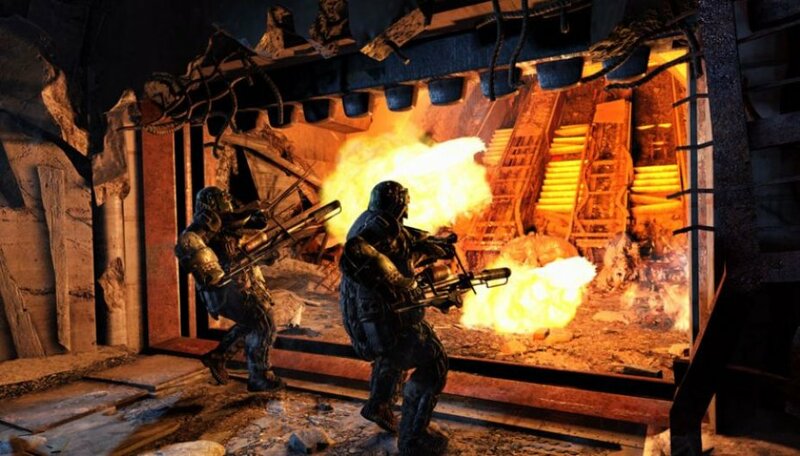 Encounters with enemies mostly consist of action/RPG style rooms with opportunities for either stealth or shooting, which are occasionally broken up by a claustrophobic encounter with the hideous mutants in the Metro’s tunnels or above its surface. Since I’m a sucker for gameplay/story integration, I have to say that it’s a risky choice putting the story ahead of the gameplay here, but I still think it pays off. I say that the game is an action/RPG, but the really clever concept that puts this above other games in that genre is that the currency of the Metro is high-quality bullets, so you have to make a choice between high-damage weapons now or the chance of better equipment later. In Negative Two point Zero Thirty-Three Thousand Years B.C.,this was pretty much a false dichotomy since there were so few places you could actually buy guns and looting them from the environment was much more viable, but that’s less of a problem here. Another great example of story being prioritized over gameplay is the stealth. Other than a Thief-style visibility meter, it’s pretty hard to tell whether or not you can be seen by any given enemy…but this is almost never a problem, since these aren’t trained fighters so much as ordinary dudes who have been drafted into an eternal war which they don’t entirely comprehend. Most of the guards will spend their time sitting around chatting with each other or taking smoke breaks, and I rarely got seen at all. The bleak realism extends even beyond that, though – quite a few common gameplay tropes are subverted for the sake of pathos. At one point you come to a fork in the tunnels, and your current buddy tells you which way to go. If you go down the other path, you might be expecting to find some rare items, maybe some health packs, but instead you see a makeshift graveyard, surrounded by rats and cobwebs. Surprising, and poignant. I didn’t have the presence of mind to take a screenshot, so please accept this cobweb that I captured when I finally remapped the screenshot button. The one change that I don’t appreciate at all is the addition of instant takedowns. They’re good for stealth gameplay, but don’t really help the story because they come with a knockout/kill command that’s completely meaningless other than helping you get the best ending. I’m not really a fan of the whole Bioshock 1 style of ending where a single kill can be the difference between making you Mother Teresa or Mama Voorhees, but 2033, A Merman I Should Turn To Be made you really work outside of gameplay for that good ending – you needed to be a well-rounded and kind person, going out of your way to find opportunities for doing good. Anyway, back to the story. Remember the huge pile of swag you found in the last game? Well, the Rangers made it a secret for reasons of national security, but it turns out the Nazis know about it, and now your pinko pal does too. This means that a war is imminent, but whoever seizes control of the pile will be almost guaranteed to return triumphant. And so you need to report back to Ranger HQ on the double – where they can also give you the resources to recapture the last of the alien ghosts. You and Pinkoman escape from the Nazi camp and make their way to the nearest friendly station, going through mutant-filled abandoned tunnels. I sort of wish there was more supernatural stuff in these sections, but the monster battles are still pretty cool on their own. Eventually, you find the tunnel collapsed, meaning you have to go above ground, braving packs of mutant wolves and what are essentially dragons. Since Artyom can’t say how he’s feeling about seeing the ruins of the world he once knew, he has to pick up a collectible piece of paper where he writes about the strange mix of sorrow, regret and fear he feels. Again, it’s a really incongruous way of doing storytelling – not that the trippy alien ghost flash-frames (about the most we get of the supernatural elements from the last game, now that most of them are dead) we occasionally get are objectively much better, but I like those because they’re consistent with the universe and tie into the themes of the game. After braving the surface for a while you come to the communist outpost of Bolshoi station, the cultural mecca of the Metro. There’s a long section where you don’t do anything but walk around and listen to people talk about their lives – the real meat-and-potatoes of a simulated world. 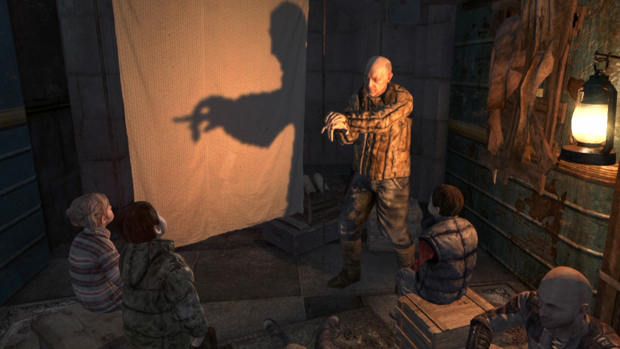 I like all the imaginative details that take advantage of gameplay mechanics – a guy uses the real-time volumetric lighting and dynamic shadows to put on a shadow puppet show for some kids, and someone uses the whatever-specifications-govern-fluid-physics to play around with toys in a filled bathtub. Top-quality stuff. A Herculean effort of advanced trigonometry, programming, and artistry to create something as unconvincing as possible. Of course, this is a WWII story and you’re the American, so all too soon you see the darker side of the Communist life: Families broken up for no reason, infirm men pressed into tough service, and your friend having to take the Friendly NPC Fate coin flip, which lands tails when he sells you out to the Red Army. Remember how I talked about the game’s flippant use of Nazi stereotypes? As I prepared to meet the Commie Command, I prepared for the Heavy from Team Fortress 2 or thereabouts – strong, patriotic and uncomplicated. Imagine my surprise, then, when instead I’m interrogated by a pair of Indiana Jones bad guys – specifically, Dr. Mengele and Col. Klink. They’re in a power struggle for control of the vast and powerful Red Army, and they want to get information from you about both the pile of swag and the last of the alien ghosts – luckily, since you’re the Chosen One, all their torture does is give you more visions, which show the ghosts protecting you at various points throughout your life. Afterwards, you escape from Communist territory with the help of some guy who was in the first game for five seconds. He promptly exits after five seconds, but not before giving you the MetroLorean: A converted DeLorean (that was just lying around under contemporary Russia for some reason), which runs on train rails. The MetroLorean provides an interesting twist on common vehicle sections – it feels like a cross between the driving sections of Half-Life 1 and Half-Life 2, so you drive your train through dark labyrinthine tunnels and occasionally encounter enemy soldiers, while simultaneously driving your car huge swaths of giant bug-infested territory. As someone who’s always adored the HL games, it’s nice to see the feel of them recreated with current-gen technology…especially since it’s taken the actual people who make Half-Life so long to do that themselves. As you take the MetroLorean out of Communist territory, you never forget that you’re not alone in the Metro – you encounter things like a broken-down caravan of families being relocated, or the remains of a normal house, relatively untouched since the nukes killed everything bigger than a cockroach inside it. A minor criticism, though – the proprietary “4A Engine” developed for the game is good at facial detail and high-res textures, but it just cannot handle ragdoll physics. When an enemy dies, they suddenly lose about 90% of their body mass and go cartwheeling and somersaulting in every direction – which really kills the mood in a game like this, especially when it’s happening to the fearsome mutants…Speaking of which, your MetroLorean finally breaks down after a lengthy battle with some brand new, more powerful examples of these mutants: In addition to the Antlions, Crazy Yetis and Balrog Juniors, we now have Scorpionfish, Giant Koi of Doom, and Man-Things (Men-things?) to contend with. After a brief introduction to all these new critters, Artyom escapes their clutches and goes to the city of Venice. In keeping with really obvious nominal symbolism that means the Communists control the Red Line and the largest city in the Metro is Polis station, Venice Station has been flooded with meltwater from the ice, and the city has quickly adapted to a seafood-based economy and culture. You get to explore it for a while, doing some of that sweet sweet world building, but all too soon you have to sneak into Communist territory, where your betraying friend shows up for no reason other than to say “Hi, you’re going the right way”, and “The alien ghost you’re looking for is real close now.” Doesn’t even give me a how-do-you-do before scampering away and forcing you to navigate the wastes of the surface. This is the longest surface section, and it’s the most climactic – most of it takes place during and after nightfall, meaning you’re more dependent on your limited resources than ever as you battle mutants and forage for items. Eventually, after a genuinely scary sequence where you have to fight the huge and powerful King Koi, you get a brief respite when you find a small Ranger outpost. You find Anna Navarre there, who’s begun to respect you now that she knows how powerful you are, but after about 2 minutes everyone gets eaten by mutants or captured by communists, because pretty much nothing good can ever happen in this game. The next sequence mixes things up, as you have to go through a system of ancient catacombs/refugee tunnels and face different kinds of mutants. The problem with this level is that it has pretty much an identical structure to the much cooler and more climactic surface sequence, and so this feels like something of a letdown. It’s pretty frightening, but it doesn’t live up to the same high standards as most of the game before it. And the boss monster isn’t nearly as cool. After that, you go into the station where the alien ghost was supposed to be, and find the Commies burning it to the ground, having infected the entire station with a deadly. virulent bioweapon beforehand as a demonstration of their power.This means that everyone is even more wretched and doomed than usual, turning the usual exploration into a grim exercise which manages to just barely stay in the realm of seriousness. It threatens to jump off those rails, though, when you find Anna Navarre, who’s not sick but seriously distressed. You both have to strip down for decontamination, and next thing we know she’s gettin’ it on like – and with – Artyom (Which, in accordance with the Terminator 1 Act of 1992, means that the game will end the next day with you two being separated forever in some fashion). It’s sort of sad how the only lady in the whole world has to be both a shallow romantic interest and a damsel in distress, but I suppose that’s the trap you end up falling into when you iterate on a story like this. Working in this plague ward is your religious buddy from the beginning of the game, who is adamant that you get the alien ghost and bring him back safe. To that end, he leads you down the rabbit hole…er, down a regular maintenance tunnel that doubles as a rabbit hole. Along the way, he explains more of his whacked-out mystical and entirely true philosophy: After so many people living in the Metro for so long, it’s gained a life of its own…and a will of its own. There’s an underground river connecting all parts of the system, which will take you to the place you most want to go if you have enough willpower to avoid drowning in it. Yeah, think about that for a sec. I don’t really like how this is handled – I think supernatural stuff works best when there’s a feasible but unlikely explanation for it – but I suppose it gets us nearer to the real plot-related stuff. Specifically, it takes us right near a train with the alien ghost on it, which you have to fight your way through because of course they’re gonna have at least one train-top battle in this rail system-based game. As a long-time subway buff, I will admit that it’s a freaking awesome experience. When you finally do catch the alien ghost, it gives you a big explanatory vision: You are the chosen one because when you were a kid, very soon after the bombs fell and just after your mom died, you were the first person to reach out to the radioactive ghosts, and willingly try to communicate with them. I really like this detail – in the first game, the “chosen one” business felt a little too arbitrary for such a bleakly realistic storyline – but I’m less big on the consequences of it. You see, when I was first playing the game I assumed it would be an Ender’s Game sort of deal when Artyom found the last alien ghost – he would end up retreating from the rest of humanity and trying to find a new place for it to live, maybe even sacrificing himself in the process. Instead, it’s much closer to E.T. – the alien turns out to be a child, who starts speaking to Artyom telepathically in his native language of horribly-accented English. The baby ghost leads Artyom to the surface, where he wanders around, and the alien views his experiences and scans his memories to learn about the world, and develop a deep bond. It can be a bit cutesy at times, but it’s a pretty interesting way of getting some perspective we’ve sent the whole game exploring, especially as we see metaphorical and metaphysical glimpses of the idyllic pre-war world. There’s also some brief mutant fighting sequences here, but they’re basically an excuse to show off the baby ghost’s ability to give you an HUD with some heightened perceptive abilities – an idea I really like. It’s cool how they manage to justify making you Batman. Soon, you reach Communist HQ, where your brand new heat-seeking alien vision comes in handy for stealth. After some sneaking that’s even more effortless than usual, you find Col. Klink from earlier, whose memories get downloaded into your head by the alien. You learn that he’s basically a puppet of Dr. Mengele, also from earlier. This makes sense in hindsight, because of course the Commu-Nazi with the facial scar in the black trenchcoat is going to be the principal bad guy. Afterward, you finally run back into your old pinko pal, who engages in an annoying boss fight before you have an alien-induced deathbed reconciliation and you continue on, fighting yet another giant mutant, which is when the operation stops being the least bit surprising or scary. 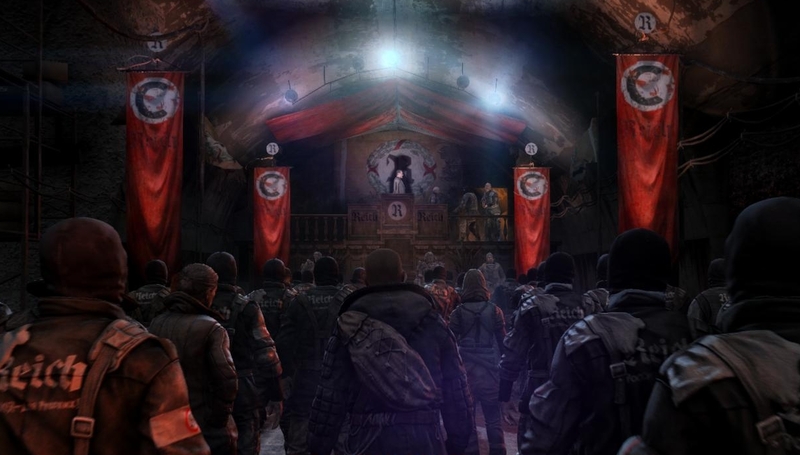 Finally, you get to the central hub of the Metro, where there’s a peace conference going on while the Commies and Nazis have agreed to split the secret pile of swag with the Rangers. Since this is a primarily political story, you crash the meeting and give your big report on the identity of the bad guy. Because it’s also a game about weird supernatural things going on, this is accomplished by your baby alien ghost buddy bringing everyone to the same ethereal dreamscape where you examine the guilty party’s memories. …Nah, I’m just fooling, though I admit that would be a really satisfying ending. Instead, there’s a big war sequence to defend the completely real pile of swag, complete with cover-based shooting and tower defense bits. This is your final boss fight, and it gets a bit too epic and action packed, so it passes from a climactic battle into pointless gunplay, even before the tanks show up (No, seriously, they’re tanks) and crush your entire force within seconds. Then, we get the ending – or rather, endings. As I said earlier, Battlefield Metro, A Saga of the Year 2033 had two wildly different “good” and “bad” endings based on how many moral hoops you jumped through. Here, though, there’s more sense to give some positive closure to the story with both endings. In the extra-good ending, the alien ghosts rise from their dormancy to defend you against the Communists, but in the regular ending you have to blow everyone in the pile of swag up to wake the ghosts up and let them go free. There’s more to it that that, of course – this movie does comply with the Terminator 1 act, after all, so there’s obviously a baby for Anna Navarre to raise in the offing – and I really like it when a series gets some unequivocal closure. 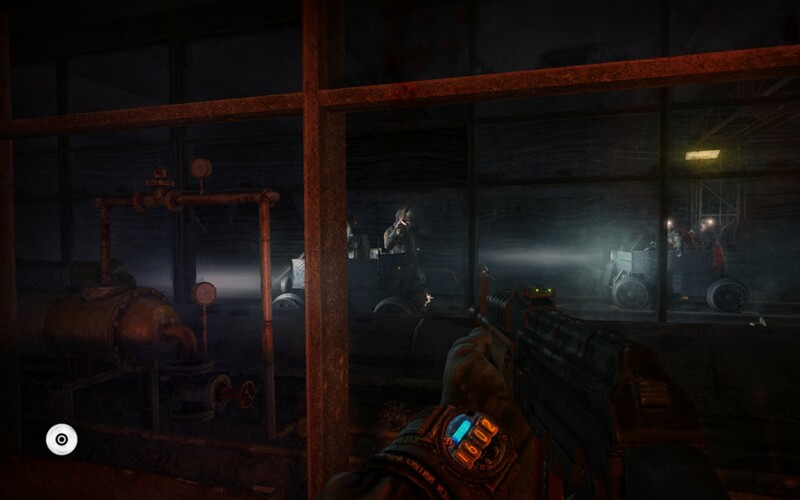 I was down on quite a few aspects of Metro Last Light, but I don’t really want that to be the tone I’m going for – it’s a supreme work of interactive action/horror, with an excellent design philosophy and top-notch world building. It’s not as good as the first one, but it’s a welcome companion.